The Black Bears and Rams take 2-0 conference records into their game Saturday. Maine and Rhode Island meet Saturday in a Colonial Athletic Association football game that could have NCAA playoff implications for both teams – a development few could have foreseen two months ago. When the CAA preseason football poll was released, the Black Bears were picked to finish eighth and the Rams 12th among 12 teams. But as the teams approach the midway point of their season, Maine (3-2) and Rhode Island (4-1) are among four teams tied for first in the CAA with a 2-0 record. The others are Elon (picked fifth) and Towson (10th). Of course, there’s a long way to go. And preseason favorite James Madison lurks at 2-1 despite a 27-24 home loss to Elon. But the early results show the CAA is tough. “I think that our league, top to bottom, every week is a tough out and anybody can get anybody,” said Rhode Island Coach Jim Fleming, whose team hosts Maine at noon. Rhode Island hasn’t had a winning record since 2001 and is coming off a 3-8 season. Maine finished 4-6 a year ago. The Rams have CAA wins over Delaware and Albany, and the Black Bears have wins over New Hampshire and Villanova. Maine Coach Joe Harasymiak isn’t entirely surprised by what has happened, with perennial powers New Hampshire and Villanova still winless in the league. “I just think that year-to-year, there’s going to be ups and downs for some teams,” he said. “If you reflect back on some of our games, a lot of them have been close over the years, in terms of playing a James Madison. We just haven’t made the plays to get it done, and the championship-experienced teams did. And that’s the difference. 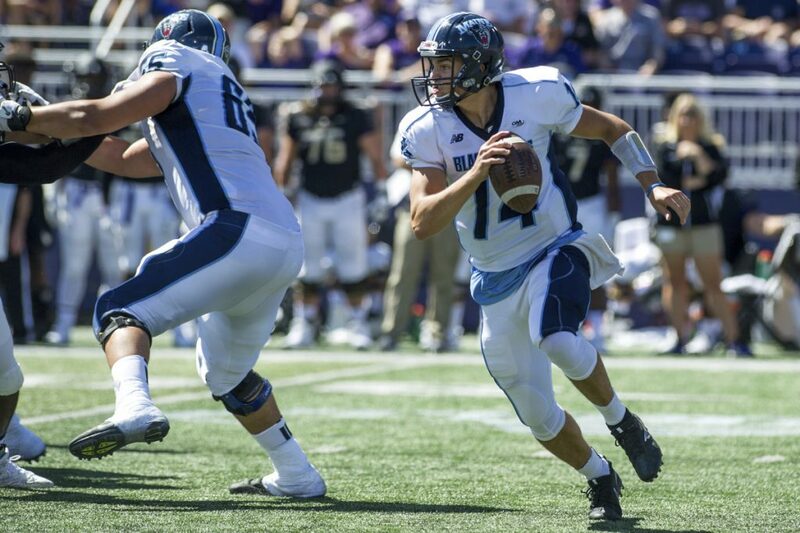 Maine senior Jeff DeVaughn said this year’s CAA leaders have something to prove. Those teams are also getting great quarterback play. Towson’s Tom Flacco, the younger brother of Baltimore Ravens quarterback Joe Flacco, leads the CAA with 296.4 passing yards per game. Rhode Island’s JaJuan Lawson is fifth with 247.8 yards. He suffered a knee injury two weeks ago against Harvard and is likely to be a game-time decision against the Black Bears. His backup, Vito Priore, threw for 310 yards and four touchdowns last week against Brown. Maine’s Chris Ferguson also will be a game-time decision as he recovers from a right shoulder injury. Redshirt freshman Isaiah Robinson has taken most of the snaps the last three games.